BTL amplifier circuit using components BJT (Bipolar Junction Transistor) which is identical / exactly the same as the amplifier. In the BTL amplifier circuit has two input signals (input) the V1 and V2. Under ideal conditions, when both inputs are identical (Vid = 0), then the output VOD = 0. This is because IB1 = IB2 that IC1 = IC2 IE1 = IE2 and. Therefore, the output voltage (VC1 and VC2) cost the same so that VOD = 0. 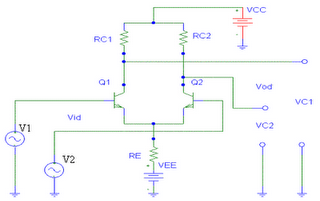 If there is a BTL amplifier circuit between the signals V1 and V2, then the Vid = V1 - V2. This will cause the difference between IB1 and IB2. With prices so BTL amplifier circuit from the IC2 IC1, so price increases VOD in accordance with the strengthening of the transistors. Reinforcement can be used to enlarge the two-level BTL amplifier circuit (cascade). BTL amplifier circuit output is connected to the input BTL amplifier circuit is the next level. With such a large total gain (Ad) is the product of the first BTL amplifier circuit gain (VD1) and the strengthening of the second differential amplifier (Vd2). In practice, the BTL amplifier circuit is preferred if only one output. So that is use the voltage between the output and earth (ground). To be able to produce an output voltage to earth (ground) is equal to the voltage between the two outputs (VOD), then one of the BTL amplifier circuit output of the second level is connecting with an emitter follower (emitter follower). To obtain better performance, then the output of emitter follower configuration connected by a so-called totem-pole. By using this configuration, the output voltage can swing in a positive X to near VCC and prices can swing in a negative way to approach the price of VEE.